Today for the #SundaySupper we had to make a budget friendly meal for when times are tough and groceries can be expensive. I am bringing one of my favorite recipes to the table! 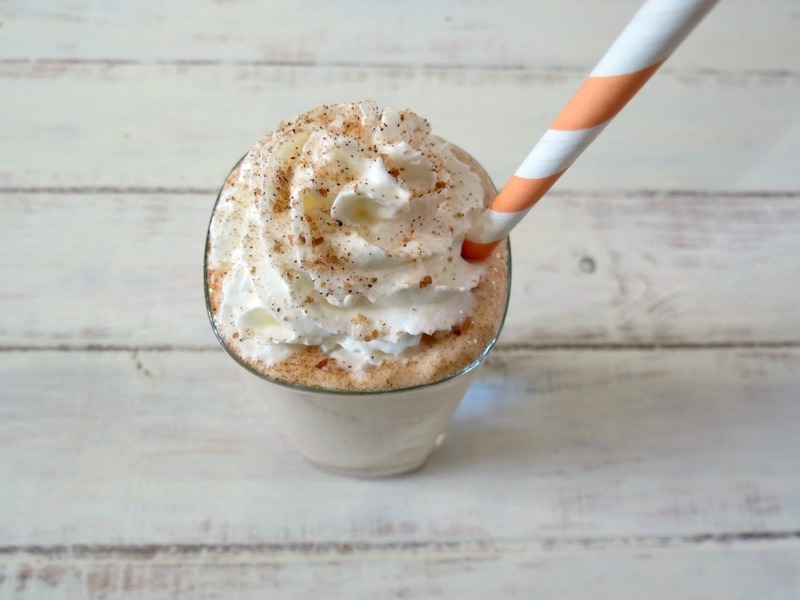 You already know I am a HUGE coffee drinker and you already know that I heart Starbucks, so today I am excited to bring to you my latest coffee concoction, the Skinny Cinnamon Dolce Frappe. Not only do I LOVE to save money, but I also love low calories! 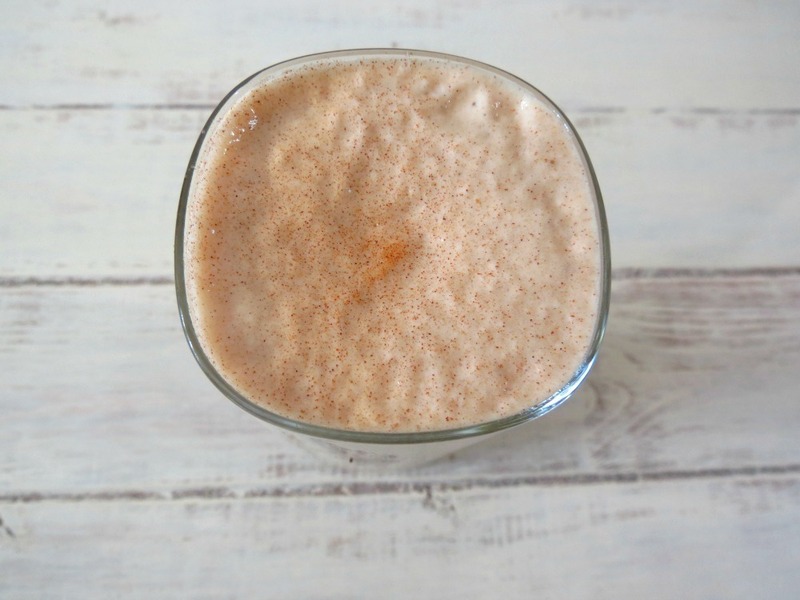 This drink is so guilt-free that you wont want to share and you can drink the whole thing yourself! You know I love to do calorie comparisons so I am bringing you that today that way you’ll want to make this at home instead of driving in the car and going to SB. Let’s check out the stats, shall we. Check out the Calorie difference. CRAZY!!! My carbs and sugar are way less too! Thank you SB, I’ll be making my Skinny Cinnamon Dolce at home! Oh and mine included whip cream! So you want to know what is this low-calorie drink made out of? Glad you asked! It’s so simple, it’s almost embarrassing. 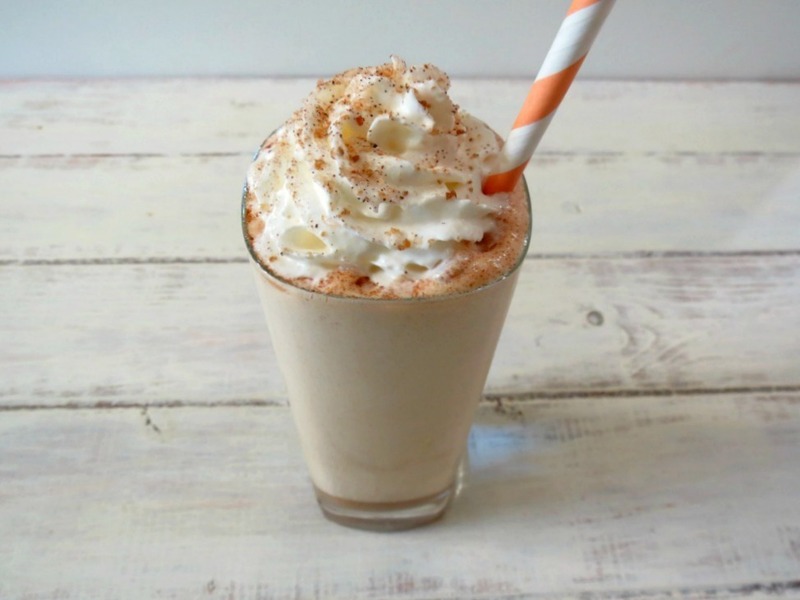 It’s skim milk, coffee, and cinnamon! That’s it! I topped it with some fat-free whip cream and a pinch of cinnamon and sugar. The taste is unbelievable I thought it would have been a little spicy and a little to earthy, but it wasn’t. It is creamy, smooth and just the right amount of sweetness. I am impressed with this one! 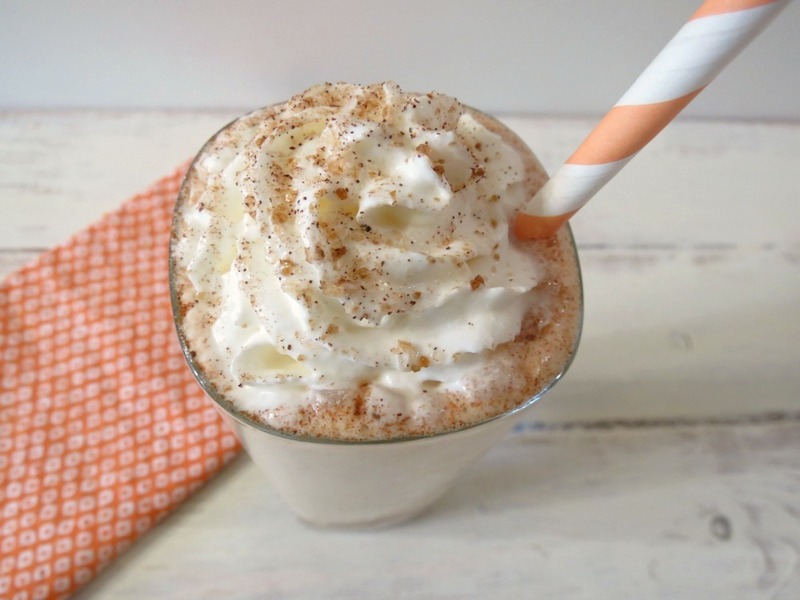 A frozen coffee drink blended with milk and cinnamon and topped with whip cream and sugar and cinnamon. In a blender add all of the Frappe Ingredients, process until smooth. Serve with a dollop of whip cream and a sprinkle of cinnamon and sugar. I used the Trader Joe's Cinnamon and Sugar Grinder. Note: For coffee, I froze 1½ cups of coffee in ice cube trays or you can freeze 1½ cups of coffee in a freezer safe container and microwave for a few seconds to soften up or leave on the counter. Last option, in a glass add 1½ heaping teaspoons of instant coffee in 1½ cups of water, refrigerate until cold and add ice cubes to the blender when you ready to make. I love friendly budget meals and I love that I can save money from not going to my favorite coffee-house! Though you know I’ll still be making my trip to Starbucks! After all I need to keep my gold card member status! Have a wonderful Sunday and be sure to check out everyone else’s friendly budget meals! I love cinnamon and coffee together! lol, thanks Jen! I drink these kind of frappes daily! They are my afternoon snack! I too love to pop into Starbucks and grab a drink. Most mornings I do make coffee at home, but when I want to get out of the house Starbucks is my place. I can’t wait to try this frappe. My only problem is going to be finding some leftover coffee to freeze. You know what I have done when I was out of coffee? I buy a venti ice coffee, plain from Starbucks and take it home and use it to make my frappes. A big venti will make about two frappes, just add ice into it. Crazy! This is so simple and made with things that I always have in the house – I could have one every single day. And I’m starting with today. YUM! I do love simple recipes, especially low calorie tasty ones! I know, I like to eat my calories rather than drink them! With food blogging there are a lot of calories to eat! Oh, yeah, making these at home would be a huge $$ saver! Looks fabulous, Jen!!! What a fabulous idea… low budget and love cal! Love it! Oh yes, those drinks to cut into the budget…what a great idea to come up with your own version. It sounds delicious! Thank you for sharing! I actually love the addition of cinnamon to my coffee. This drink looks delish and delightful! Thanks Laura! I like to add cinnamon to my regular coffee myself. I bet this would be really great with coconut milk too! I have yet to try it that way, but I already know it will be good! I know even though SB drinks can be sugar free, the calories are insane. I found out they use a Cafe syrup that makes coffee flavor, that is where all the sugar is. Eck! Love this! Starbucks is my fav, but I don’t like the costs that come with it (money and calories) . Thanks for sharing. =) It also helps that I love cinnamon. Ohhhhh, I love cinnamon too! I can’t get enough of it, just wait till Tuesday’s recipe! I spend a tiny fortune a week at Starbucks, glad I can make them at home. The cinnamon dolce is one of my favorites. This looks so easy to make at home! Thanks Stephanie! It’s now one of my favorites! Love how super easy this is to make, Jennifer! Thank you! It’s crazy how easy these drinks are to make at home. I should really do it more often. I sent this to my aunt, these are her weakness in the city! Oh thank you for forwarding to your Aunt, that is so sweet. We are all about doing stuff at home to save some $$. Love that you conrol the ingredients!! Thank you! I am always happy to save a few bucks especially on coffee drinks! This looks so yummy…I think I’ll try it with almond milk! This looks wonderful. And as someone who worked at Starbucks for 8 years and saw how much people spent on their daily addiction, we had some people who came in twice a day, I say this is a much better habit to get into. I am so guilty of stopping at Starbucks one too many times. Love how I can make my own frappe at home! It’s been pretty warm here, actually down right hot some days, so the frappe is a refreshing drink to have! Wow! I have just found my cool treat for hot summer afternoons. You have no idea how much I love cinnamon and coffee too. I’m all over this one. 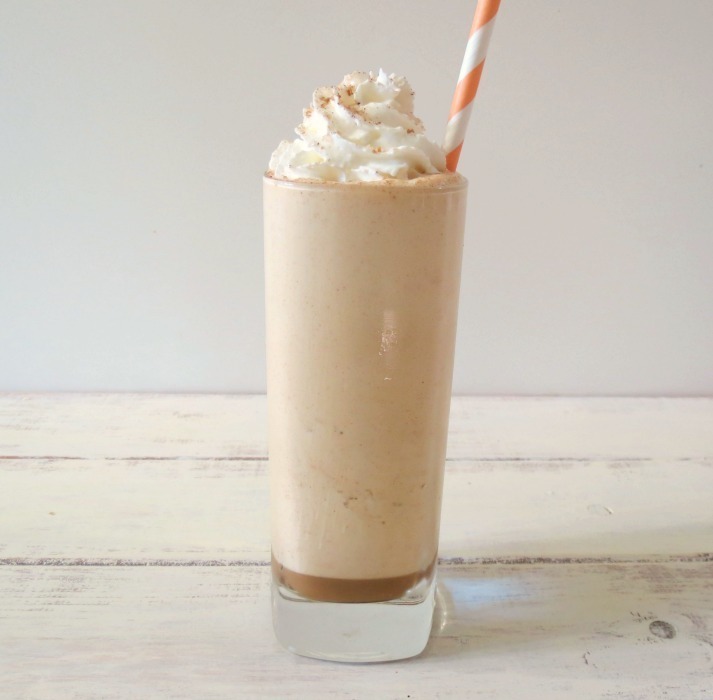 What a great idea sharing a DIY frappe for budget #sundaysupper! I love my Starbucks too and while I won’t see myself giving them entirely, it would make my budget much happier if I replaced some with one I make at home….and yours looks great! Great recipe!! Love that you skinnied this up and you can make it at home.